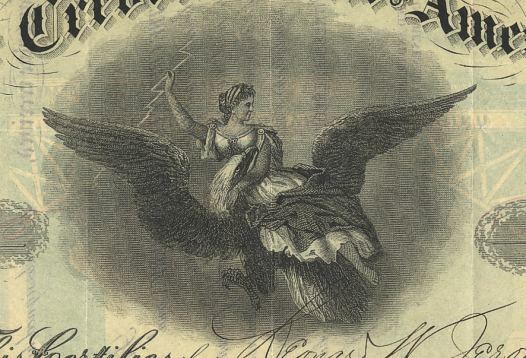 Beautiful certificate from the Credit Foncier of America issued in 1867. 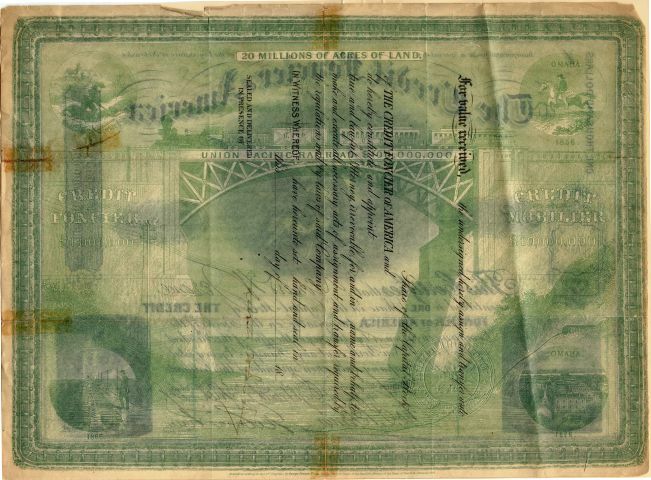 This historic document was printed by Henry Spear Company and has an ornate border around it with a vignette of an angel holding a lightning bolt, a historic building, and a group of buffalo. This item has the signatures of the Company's President, George Francis Train and Secretary, George P. Bemis. Credit Foncier of America was a late 1800s financing and real estate company in Omaha, Nebraska. The company existed primarily to promote the townsites along the Union Pacific railroad, and was incorporated by a special act of the Nebraska Legislature in 1866. Credit Foncier was said to be "intimately connected with all the early towns along the Union Pacific." While related to Train's Cr�dit Mobilier the company was not embroiled in the scandals that tore that organization apart. Founded, controlled, and initially owned by eccentric railroad booster George Francis Train, Credit Foncier was named after Credit Foncier de France. Along with support from businessman Cyrus McCormick, Omaha banker Augustus Kountze was among the original "special commissioners" appointed by the Legislature to form the company. The company is said to have been organized to "profitably dispose" of the Union Pacific's land grant acreage. The company owned almost 5,000 acres (20 km2) in Omaha; 1,000 in Council Bluffs, Iowa, and 7,000 in Columbus, Nebraska, along with other land along the Union Pacific mainline. Train once explained, "One of my plans was the creation of a chain of great towns across the continent, connecting Boston and San Francisco by a highway of magnificent cities." 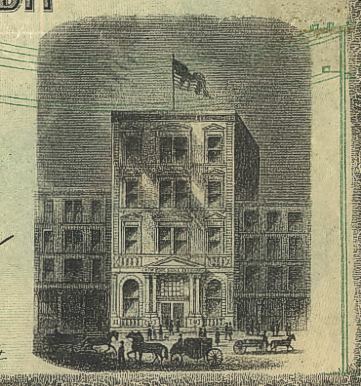 The company built a hotel it called the "Credit Foncier" in Cleveland, Nebraska in 1868; not liking its success there it was moved to Columbus the next year. George Train, with so much land in the city, predicted a great future for Columbus. Train is credited with writing newspaper articles and delivering speeches in which he promoted the town, calling it, "Columbus, the new center of the Union and quite probably the future capital of the U.S.A."
Train served as president of the company; George P. Bemis was the secretary. Bemis later became mayor of Omaha. Two of his investments in Omaha marked the city's history, including the Cozzens House Hotel. The other, originally called "Train Town" for its owner and still entitled "Credit Foncier Addition" in city records, yielded Train "a small fortune" as he sold homes and empty lots to new settlers just south of Omaha. Train later moved the headquarters of Credit Foncier to Denver, Colorado, and again to Tacoma, Washington. Along with Omaha, Train promised each city it would become the "gleaming metropolis" of the Union Pacific. George Francis Train (March 24, 1829 � January 5, 1904) was a businessman, author, and an eccentric figure in American history. Train was born in Boston, Massachusetts in 1829. At the age of four he was orphaned in New Orleans after a yellow fever plague killed his family. He was raised by his strict Methodist grandparents in Boston, who hoped he would become a minister. Throughout his life Train was engaged in the mercantile business in Boston and in Australia, then went to England in 1860 and undertook to form horse tramway companies in Birkenhead and London where he soon met opposition. Although his trams were popular with passengers, his designs had rails that stood proud of the road surface and obstructed other traffic. In 1861 Train was arrested and tried for "breaking and injuring" a London street. Train was involved in the formation of the Union Pacific Railroad during the civil war but left for England in 1864 after having helped others set up the Credit Mobilier company. Referring to himself as "Citizen Train", he became a shipping magnate, a prolific writer, a minor presidential candidate, and a confidant of French and Australian revolutionaries. He was offered the presidency of a proposed Australian republic, but declined. Train was likely the inspiration for Phileas Fogg in Jules Verne's Around the World in Eighty Days, although he managed to accomplish the feat in 67 days. A plaque in Tacoma, Washington commemorates the start and finish point. (Note: The Tacoma trip was Train's third around the world and took place in 1880. It was not the trip that may have inspired Verne, which took place in 1870.) He was accompanied on the trip and many others by a long-suffering cousin and private secretary named George Pickering Bemis, who later became mayor of Omaha, Nebraska. While in Europe after his 1870 trip, Train met with the Grand Duke Constantine. During that period he also persuaded the Queen of Spain to back the construction of a railway in the backwoods of Pennsylvania. This was the beginning of the Atlantic and Great Western Railroad. He also promoted and built new tramways in Britain after some opposition, which was eventually overcome by offering to run the rails level with the street. On his return to the U.S., Train's popularity and reputation soared. He began promoting the great Union Pacific Railroad which he had been involved with for several years, despite the advice of Vanderbilt, who told him it would never work. Forming a finance company called Credit Foncier of America, Train made a fortune from real estate when the great railway running from coast to coast opened up huge swathes of western America, including large amounts of land in Omaha, Council Bluffs, Iowa and Columbus, Nebraska. He was responsible for building the Cozzens Hotel and founding Train Town in pioneer Omaha. Along with Credit Foncier, Train's most infamous creation was Credit Mobilier, which he started specifically to sell construction supplies for the Union Pacific. That venture was torn asunder by scandals that rocked the nation. Train ran for President of the United States of America as an independent candidate in 1872. He was a staunch supporter of the temperance movement, and was jailed on obscenity charges while defending Victoria Woodhull. He was the primary financier of the newspaper The Revolution, which was dedicated to women's rights, and published by Susan B. Anthony and Elizabeth Cady Stanton. As he aged Train became more eccentric, in 1873 he was arrested and threatened with being sent to an insane asylum. He stood for the position of Dictator of the United States, charged admission fees to his campaign rallies and drew record crowds. He became a vegetarian and adopted various fads in succession. Instead of shaking hands with other people, he shook hands with himself, the manner of greeting he had seen in China. He spent his final days on park benches in New York City's Madison Square Park, handing out dimes and refusing to speak to anyone but children and animals. He became ill with smallpox at the residence of his daughter, Susan M. Train Gulager, in Stanford, Connecticut in 1903. He died in New York and was buried at a small private ceremony at Green-Wood Cemetery. On his death The Thirteen Club, of which he was a member, passed a resolution that he was one of the few sane men in "a mad, mad world." George Pickering Bemis (March 15, 1838 � December 11, 1916) was a real estate, loan and collection agent, and one-time mayor of Omaha, Nebraska, USA. Bemis was born in Boston, Massachusetts to a prominent Massachusetts family. When he was 13 he moved to New York City, New York, spending nearly twenty-five years there. He spent seventeen years as his cousin George Francis Train's private secretary. Bemis traveled extensively, accompanying Train in many toursover and around the world. He came to Omaha in April, 1868 as secretary and manager of one of Train's companies called Credit Foncier of America. He quit that job when Train was indicted in New York. On returning to Omaha Bemis was a real estate agent throughout the city, selling lots in the Credit Foncier Addition and focusing on his own subdivision, which today is referred to as the Bemis Park Landmark Heritage District. As the mayor of Omaha from 1892 to 1896 Bemis did a great deal to promote parks throughout the city. After funding a women's rights newspaper in the late 1870s Bemis offered to send $100,000 to the Federal Government in order to keep activist Emmeline Pankhurst from being deported in 1913.